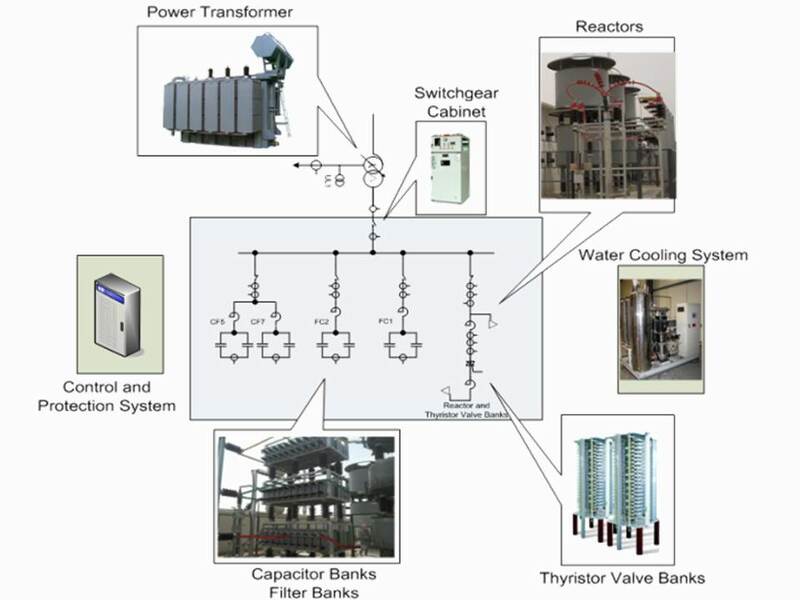 The Static Var Compensator – SVC VISION cconsists of thyristor switches that control the current in reactors and / or capacitors, producing dynamic shunt compensation. It is used to supply reactive power demand, eliminate losses of active power, voltage regulation, elimination of harmonics, voltage fluctuation and flicker and to increase the power factor. The SVC is an effective solution in providing dynamic reactive power, with fast response time, and low maintenance cost. In the case of long distance AC transmission due to the influence of the Ferranti effect, the voltage in the middle of the transmission lines can climb by limiting the power transferred. To reduce this voltage increase and maximize the power transferred, SVC is usually installed at the middle point or several points in the middle of the transmission line, by regulating the voltage. Furthermore, an SVC system installed on the side of a DC AC converter can provide enough reactive power with quick response. The SVC can be connected to the terminal substation in a power distribution system to reduce reactive power exchanges, improve power factor, reduce losses in the distribution system and reduce the damage caused by frequent switchings of capacitor banks. AC arc furnaces generally have large demands for reactive power, great generation of harmonics and large current negative sequence. Besides, the SVC system provides reactive power to the industrial plant, eliminates the harmonics generated by rectifiers and prevents voltage fluctuation. Increasing the power factor and reactive power dynamic compensation.